counter)induction: it goes up to eleven. We’re psyched to announce our 09-10 season—our eleventh! c)i is presenting an exciting and wide-reaching year of music both brand-new and timeless. We’re also happy to be playing three out-of-town gigs—two in Philadelphia and one in Syracuse. FINIS TERRAE presents renderings of the perimeters of being, its beginning and end, and the space between the real and the notional. Gorecki’s string trio Genesis I imagines the energy and tumult of the foundation of the world, while Messiaen’s Quartet for the End of Time muses upon its apotheosis and what comes after. Mohammed Fairouz’s new work Kālas, for clarinet and viola, considers the famous line: kālo ‘smi lokakşayakŗt pravŗddho’ (I am time, the mighty destroyer of worlds) from the eleventh chapter of the Bagavad Gita, exploring the connection between enlightenment and mortality. counter)induction returns to its spawning grounds of the University of Pennsylvania, featuring performances of works from our decade of concert making. Douglas Boyce’s monumental Deixo | Sonata for viola and piano keeps company with Salvatore Sciarrino’s arresting Centauro Marino, while Eric Moe’s sardonic Dead Cat Bounce, written just for c)i, counterpoints Kyle Bartlett’s transfixing adagio sostenuto. CODEX will present an evening of music engaging with the mechanisms and mythologies of musical traditions and their creation, and the possibility of inspirations from sources real and imagined. Starting with a singular, enigmatic, and historically / culturally isolated source, a collection of late-medieval polyphony contained in the codex Torino J.II.9, five composers imagine what a centuries-long tradition flowing from the works and practices of the codex might sound like, producing real works in a fictional tradition. New works by Peter Gilbert, Christopher Jon Honett, Douglas Boyce, Kyle Bartlett and Ryan Streber will be featured. THE CHILD IS FATHER TO THE MAN examines two seminal 20th century composers by presenting their works with those of their students, metaphorically searching for hidden traits expressed in the musical genetics of the next generation. Iannis Xenakis and George Crumb are presented here not as remote figures of genius, but as mentors and master craftsman, shaping the future through their connections with younger composers. Xenakis’s indomitable Ikhoor is balanced by Trio Rombach of Pascal Dusapin, his only recognized student. Kyle Bartlett, one of Crumb’s last pupils, will present a world premiere companion to Crumb’s timeless Eleven Echoes of Autumn. Keep your browsers pointed to counter)induction on Facebook, the counter)induction YouTube channel, on our blog, and the website, for updates, concert footage, podcasts, and more! See you on September 19th! Review in the Times and Upcoming NYC Season! I hope everyone is having a great summer, and wanted to give everyone an update on everything c)i. All in all, it was an inspiring end to our decade, and a wonderful incentive to make our upcoming one even more exciting. Sadly, our violinist Sharon Roffman has had to leave us - but for very good reasons. She is now living abroad and is in the middle of deciding which of the plum jobs offered to her she should take. However, we are more than pleased to announce that Miranda Cuckson will be joining us for our season this year. Miranda is no stranger to c)i, and you can hear her playing with Sumi and I on Doug Boyce's "102nd and Amsterdam" in our web site's Listening Room. 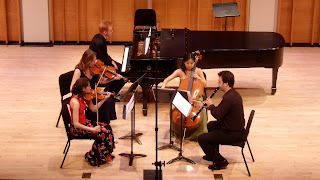 A video of Jessica Meyer and Steve Beck playing my 'Deixo | Sonata' at Merkin Hall in June; an extraordinary performance! More video clips from our Merkin Hall show will become available in the next few weeks, and we'll post them all here!